The Uyghur Autonomous Region of Xinjiang covers an area of 1,660,001 km2, roughly the size of Iran. During the Han Dynasty, Xinjiang was known as Xiyu, or ‘western regions’. 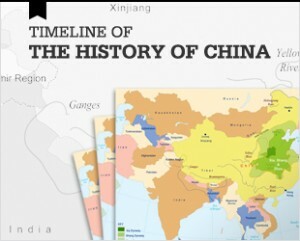 It became Xinjiang or ‘new borders’ when it was annexed by China during the Qing Dynasty. 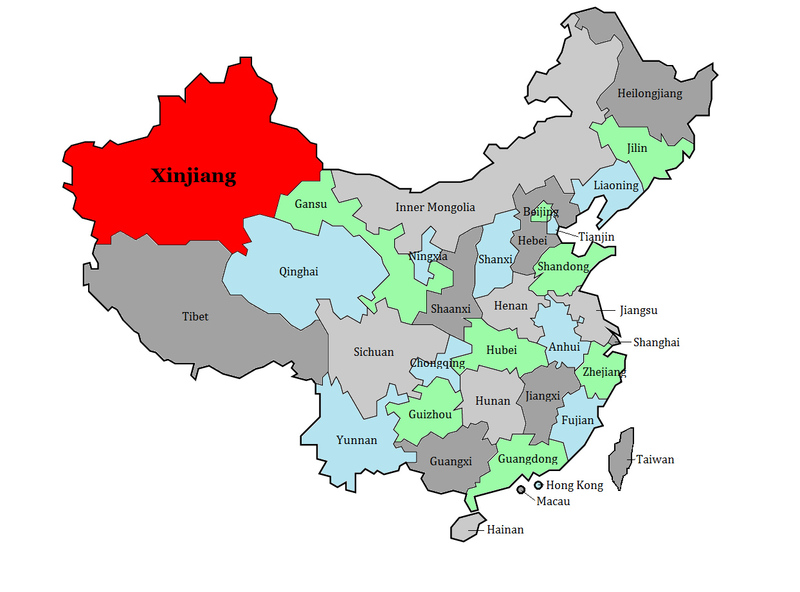 Xinjiang is China’s most western most region, and borders Russia and Mongolia to its north, Kazakhstan, Kyrgyzstan, Tajikistan, Afghanistan, Pakistan and India to its west, Tibet to its south, and Gansu and Qinghai to its east. Xinjiang first encountered the expanding Chinese empire during the Han Dynasty in 2nd century BCE when China’s borders stretched in its direction to protect the valuable Silk Road trade routes where silk was traded for the ponies necessary to fight nomads that were constantly harassing China from the north. China’s military control over the area weakened after the Han Dynasty fell. It wasn’t until the 7th century Tang Dynasty that China reasserted its tentative grip, but by the 8th century, indigenous rule again triumphed. It was during this time, that Islam began its slow spread to the region. In the early 13th century, Xinjiang came under Chinese control when it fell to the Mongols under Ghengis Khan during the Yuan Dynasty. After the Mongols retreated from China when the Yuan Dynasty fell, Xinjiang remained under Mongol control. It took until 1882 before Qing Dynastic China regained control of the region, and Xinjiang became officially a Chinese province. When the Qing fell in 1911, Xinjiang was ruled by various warlords; twice it tried to win independence from China. After the founding of the People’s Republic of China, in 1954, Mao Zedong formed the Xinjiang Production and Construction Corps (XPCC) by demobilizing 105,000 Xinjiang People Liberation Army soldiers to settle with families to farm Xinjiang with the expectation that they would quickly mobilize in case of regional instability. Xinjiang Production and Construction Corps is China’s only existing Production and Construction Corps; it functions as a special social organization integrating military, political and business objectives. After the chaos of the Cultural Revolution, XPCC was abolished in1975, and all of its powers were transferred to the government of Uyghur Autonomous Region of Xinjiang which replaced Xinjiang province in 1955. Yet, after the Soviets invaded Afghanistan in 1979, Beijing reopened XPCC in 1981. According to research by the Economist, the politically autonomous XPCC today controls an area within Xinjiang close to the size of Taiwan, and is expanding steadily. It operates its own schools, hospitals, courts and prisons. Approximately 86% of the 2.6 million people under its control are ethnically Han. The XPCC generates almost 17% of Xinjiang’s GDP and controls hundreds of business operating in everything from agriculture to coal mining. 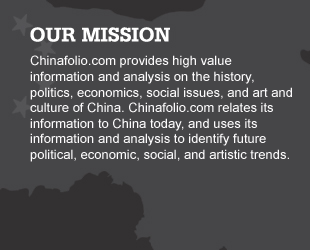 The XPCC expects its 2011-2015 annual GDP growth to be 5% higher than that of Xinjiang as a whole. XPCC’s development efforts in Xinjiang have increased economic inequality between the native Uyghur and Han populations, adding to what have been growing ethnic tensions in the area. In 2008-2009 a spate of ethnic violence broke out, leading to scores of deaths in the region. A large majority of the non-Han population supports themselves by oasis-based agriculture, with wheat making up half of the total crop. Rice, corn, millet, kaoliang and millet are also farmed in large quantities, and Xinjiang is self-sufficient in these crops. Xinjiang also produces cotton and sugar beets as well as fruit including melons, grapes, pears and apples. 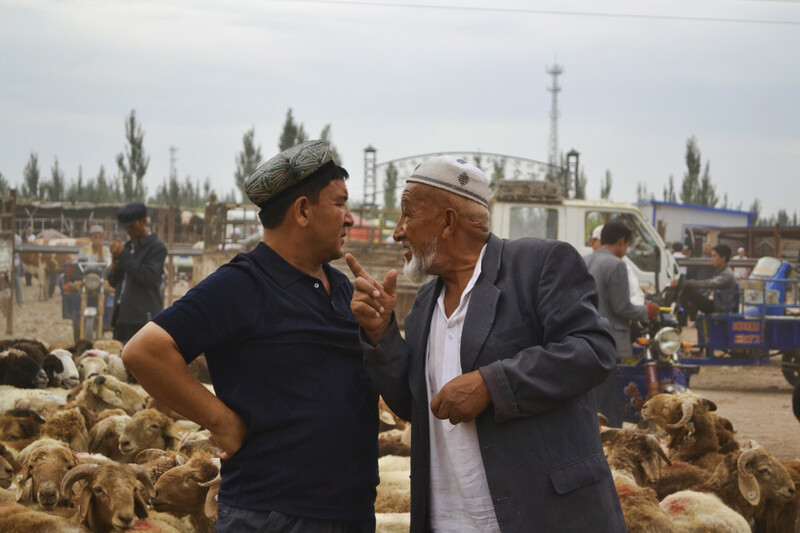 A smaller percentage of Xinjiang residents are herders. Mining and mining industry are developing rapidly in Xinjiang, including the mining and processing of coal, iron, zinc, chrome, nickel, copper, molybdenum, gold and tungsten. There are iron and steel works in Xinjiang, as well as a cement factory at Urumqi, Xinjiang’s capital city, and a farm-tool plant at Kashgar. The rapid development of mining has driven Xinjiang’s GDP growth, from $28 billion in 2004 to approximately $150.8 billion in 2014. Petroleum and natural gas production have also contributed to Xinjiang’s expanding economy. This growth can be seen in the changes in Urumqi, Xinjiang’s capital city. In 1990, Urumqi had a population of 1 million mainly non-Han residents. As developments of gas and mineral mining have increased, Urumqi has grown a pace. By mid-2000, its population had risen to almost four million people, with the majority of new residents being Han. Most of Xinjiang’s growth has disproportionately benefited Xinjiang’s Han residents. Southern Xinjiang, for instance, with only a 5% Han population, has a significantly lower per capita income compared to Xinjiang as a whole. There are a number of different physiographic regions in Xinjiang, which is one of the most geographically diverse provinces in China. The Northern Highlands, located in the northern reaches of Xinjiang, is a very mountainous area which borders Russia, Mongolia, and Kazakhstan; there is a large immigrant population living in Xinjiang from these areas. The Altai Mountains occupy most of this region, with its peaks averaging around 1,400m above sea level. The Junggar Basin is triangular-shaped basin also located in northern Xinjiang with a total area of around 380,000km2. The Altai Mountains border its northeast, the Tian Shan its south, and the Kazakhstani Zhongghar Alatau Mountains its northwest. On the east and west ends, the basin opens. A gap in the northern mountains allows moist air to travel into the basin providing the area with enough moisture to allow a thin layer of vegetation to grow. That said, the basin receives only 6–12 inches of rain annually. A ring of oases at the foot of the enclosing mountains provides the mainly Kazakh and Torgut Mongol locals with water for agriculture. Underneath its surface, there are significant oil deposits. The Junggar Basin is also home to a forest of an ancient species of poplars. Dating back over 65 million years, the forest is the oldest primeval forest of diversiform-leaved poplars in the world, and is known as a ‘living fossil’. Formed by the collision of the Indian and Eurasian plates, the Tien Shan Mountains are one of the longest mountain ranges in Central Asia. Known as the Celestial Mountains, the Tian Shan Range, occupies nearly one-quarter of the area of Xinjiang, and houses some of China’s most beautiful scenery. Indeed, Daoists believe that the mountains are so beautiful that the Queen Mother of the West, Xi Wangmu protects the peach trees of immortality hidden within its ranges. The Tian is not completely Chinese; it also stretches into Kazakhstan, Kyrgyzstan, and Tajikistan. Mountains in the Tian Shan are at their highest in the west, and decrease in elevation as they move east. The Tarim Basin is delineated by the Tian Shan to the north, the Pamir Mountain Range to the west, and the Kunlun Mountains to the south. 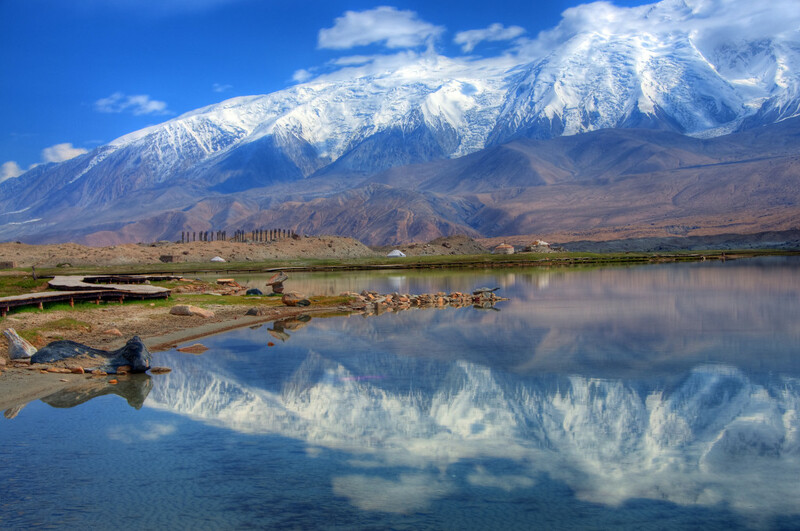 Occupying about half of Xinjiang, its water comes from rivers running down from the mountain ranges surrounding it. Like most rivers in Xinjiang with the exception of the Irtysh River, these rivers empty into the deserts or the regions’s salt lakes. According to Chinese Geologists, the Tarim is thought to contain large reservoirs of petroleum and natural gas, especially methane. 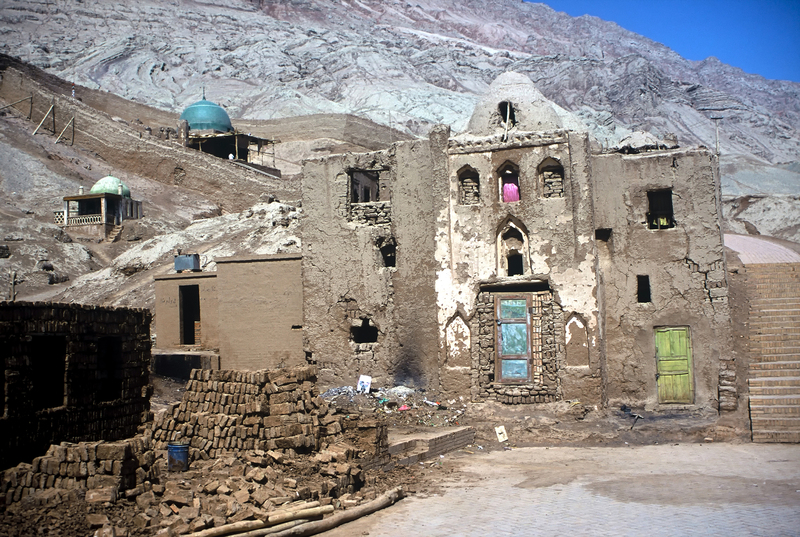 Due to its difficult conditions, including highly variable temperatures and almost no precipitation, the Tarim Basin is believed to have been one of the last places in Asia to support human habitation. 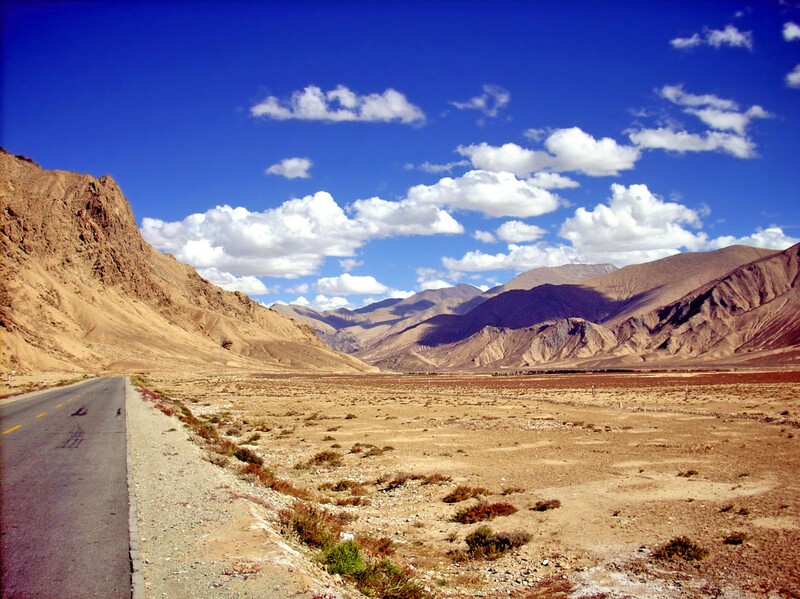 Within the Tarim Basin, is Takla Makan desert which covers approximately 320,000 square km. The Takla Makan is almost completely infertile, and from this barrenness comes its name which means “once you go in, you never come out”. Marco Polo is believed to have crossed the desert during his travels along the Silk Road, likely by joining a caravan of camels which went from oasis to oasis as they crossed in temperatures which during the summer can exceed 120 F and in the winter fall below zero. 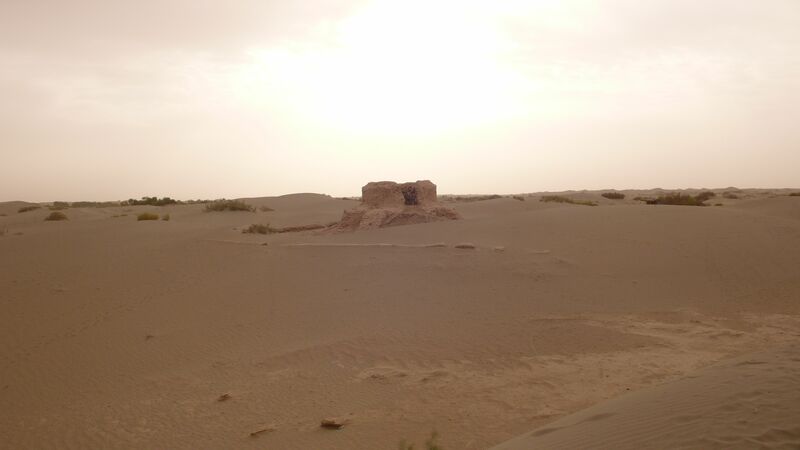 Within the Takla Makan desert is the Turpan Depression. Covering an area of 50,000 square kilometres, the Turpan Depression is the lowest point of dry land on Earth. Its agriculture is supported by the ancient Karez System of underground tunnels, wells, ground canals, and small reservoirs which channel water from the surrounding mountain ranges into desert oases. Begun during the Han Dynasty, the total length of the Karez canals is about 5,000 km in length with 60% of them still in use today. The Karez irrigation system is considered to rank alongside the Great Wall of China and the Grand Canal as one of the three great engineering projects of Imperial China. Over the centuries, millions of hours of forced labor were required to build them. Its water grows fruit famous for their high sugar content, especially their grapes. The Kunlun Mountains are a massive mountain range, crossing several provinces, though the majority of which are located in Xinjiang. They make up most of the northern part of the Qinghai-Tibetan plateau, with its peaks reaching heights of over 7000m above sea level. Many believe that the Kunlun Mountains house the paradise of Daoism; others believe the Mountains were the home of the mythical Yellow Emperor who was the father of Chinese culture. Bordering Kazakstan, Ili is a region of steppe and mountain in Xinjiang populated primarily by Kazak herdsman many of whom gather around Sayram Lake during the summer months. To the east of the Ili River Valley, the Narati covers a total area of 400 square kilometers, with an altitude of 1,800m. 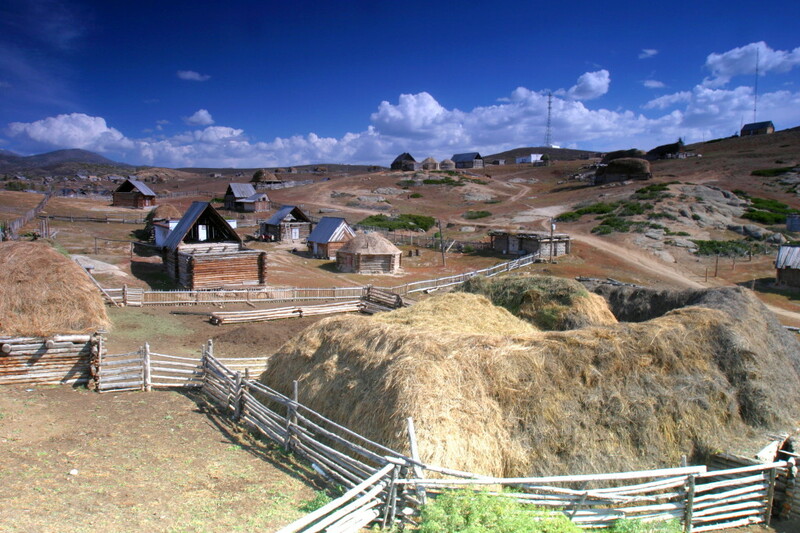 ‘Narati’ means “the place where the sun rises” in the Mongolian language. As one of the world’s four largest grasslands, the Narati Grassland has been pastureland since ancient times. 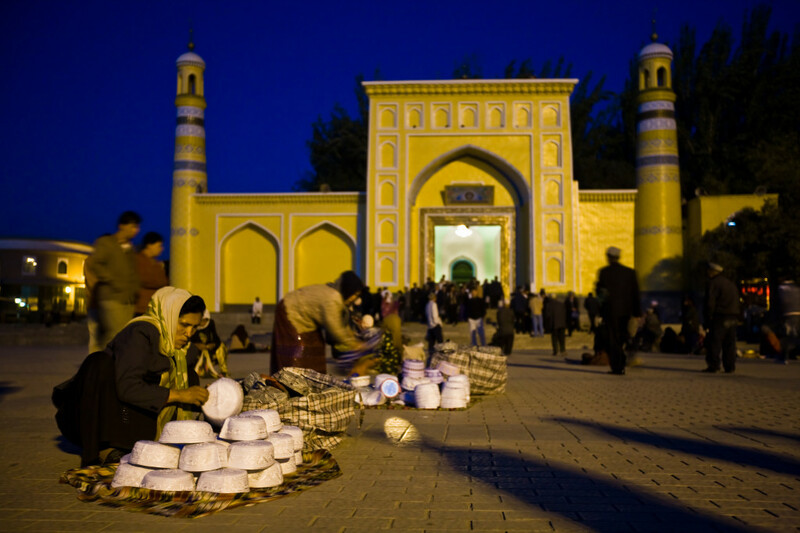 The Kashgar market has been an important trading centre since the days of the ancient Silk Road. 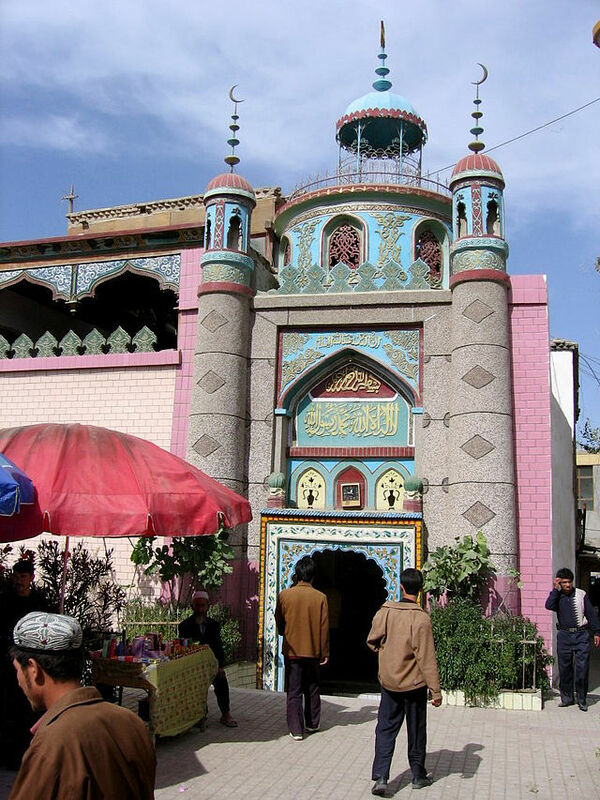 Kashgar is the Western-most town in China and the local population is a mixture of Uyghurs, Han, Kyrgyz, Tajiks and Uzbeks. The Gobi Desert race, which starts just outside Kashgar, is one of the world’s toughest endurance races, an annual 250 km seven-day, six-stage event that attracts worldwide competitors. 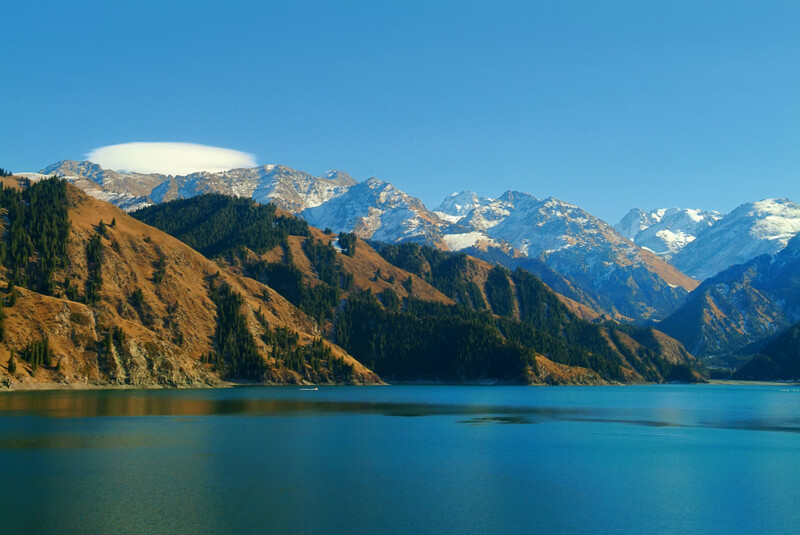 The picturesque Heavenly Lake, halfway up Mt Bogsdo in the Tian Shan Mountains, was added to the UNESCO Man and Biosphere Reserve program in 1990. 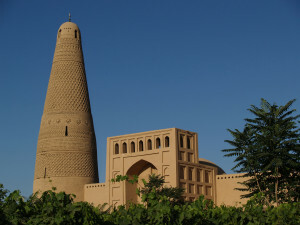 The City of Turpan, sometimes referred to by its Mandarin name of Tulufan, situated in the Turpan Depression, was a popular oasis during the Silk Road Days and is today an agricultural city populated primarily by Uzbeks, Kazakhs, Tadjiks and Han Chinese known for its nighttime bazaars. Near the Tian Shan Grand canyon there is a thousand-Buddha cave from the Tang Dynasty where the paintings are largely well preserved. One of the world’s architectural wonders in Yarnaz Valley, the ancient city of Jiaohe (Yarkhoto) is the largest, oldest and best-preserved earthen city in the world. The Flaming Mountain, the most famous attraction of Gaochang, Turpan, is a red granite mountain in the north of the Turpan Basin. It is over 1,000 km long with its main peak at an altitude of 831.7 meters. The mountain is the hottest place in China reaching over 50 degrees and appears to be on fire at times as the sun hits the red stone.